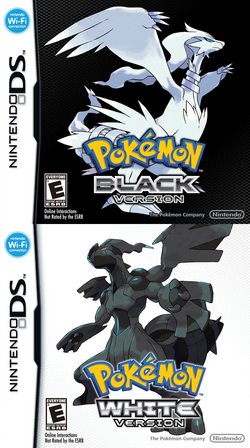 Pokémon Black and White (ポケットモンスターホワイト・ブラック, Poketto Monsutā Burakku Howaito?, "Pocket Monsters: Black & White") are the two primary paired games in the fifth generation of Pokémon role-playing games. They are being developed by Game Freak, and published by Nintendo, for the Nintendo DS. They were released on September 18, 2010 in Japan, March 4 in European coutries, March 6 in North America and March 10 in Australia. Among the new Pokémon to debut are the three starter Pokémon, Snivy, Tepig and Oshawott, along with Zoroark and its pre-evolution Zorua, and two legendaries, Reshiram and Zekrom. The games feature several new technological updates, including full 3D movement, routes and cities, and a redesigned battle scene. They take place in a new region known as Unova, which is said to be a foreign area, located far away from the previous regions. Japanese logos for the games. This page was last edited on 22 September 2016, at 20:49. This page has been accessed 199,783 times.